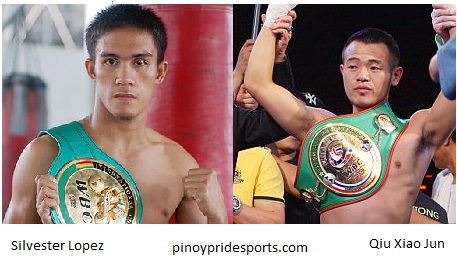 Filipino boxer Silvester "Stallone" Lopez will face Qiu Xiao Jun of China on February 22, 2015 for WBC Silver super bantamweight title. The fight will happen in China. - Silvester Lopez of the Philippines is a KO puncher, he has a record consisting of 23 wins with 17 of his wins are by way of KO and has 9 losses. He is a 27 years old from Kabasalan, Zamboanga Sibugay, Philippines. Lopez is a former WBC International super flyweight champion, WBC Silver super flyweight champion, WBC Youth Silver super bantamweight champion and the current WBC International bantamweight Champion. Also he is a former challenger for WBC World super flyweight title, but he loss the fight against Yota Sato of Japan in 2012. - Qiu Xiao Jun a 24 years old boxer from Suzhou, China. He is the current WBC Asian Boxing Council Continental super bantamweight champion and he defended it for two years. Now Qiu Xiao Jun is trying to step up with his record of 14 wins 6 by KO and has 2 losses. Qiu Xiao Jun won his last fight against Ruslan Berchuk Russia via 1st round KO.